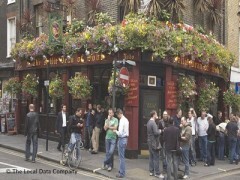 About: The Nellie Dean is a traditional London pub in the heart of Soho. It is popular with locals and particularly as a place to unwind after work. They have fruit machines, games machines, a pool table and a juke box. They do not serve food. Private parties of up to 80 people can be accommodated for upon request. Pavement seating is also provided.